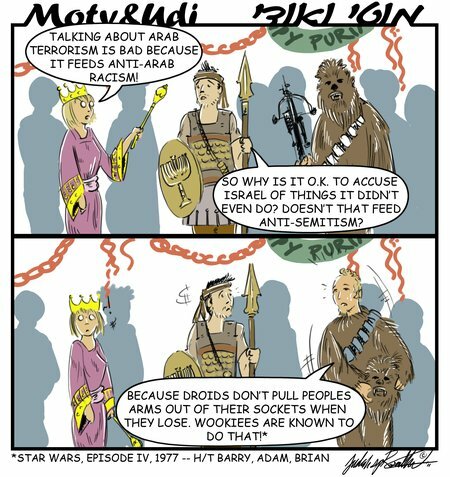 Not everyone is a Star Wars fan, but we are all familiar with the double standard under which it is just fine to accuse ‘Zionists’ of every despicable behavior imaginable, while it is considered inappropriate — and often dangerous — to talk about the Arab and Muslim propensity to terrorism. Today the massacred Fogel family was buried in Jerusalem. And as anticipated, the moral depravity of the Arabs is finding a grotesque echo in the moral bankruptcy and worse of the British and American ‘liberal’ media – a sickening form of armchair barbarism which is also in evidence, it has to be said, on the comment thread beneath my post below. Overwhelmingly, the media have either ignored or downplayed the atrocity – or worse, effectively blamed the victims for bringing it on themselves, describing them as ‘hard-line settlers’ or extremists. Given that three of the victims were children, one a baby of three months whose throat was cut, such a response is utterly degraded. Her words went far beyond just denouncing the killings. It was a far more generalised racist outburst against Arabs as a whole. (3/11) The Israel lobby views any progress made by UK Muslims in this country’s political life as being against their interests. The only permissible Muslims are those who are prepared to remain silent about the crimes perpetrated by the apartheid state of Israel. (2/11) Robert Halfon [a British MP] – you are a total and utter coward, much like the members of the murderous Israeli Defence Forces. Whereas the IDF like to hide inside their tanks while firing shells at little children, you hide inside the House of Commons while making your libellous comments. (10/10) David Cameron spoke out against any calls to punish Israel for its continuing occupation of Palestinian lands, its illegal Jewish settlements, its cruel and barbaric treatment of the besieged and repeatedly bombed people of Gaza and its known stockpile of nuclear weapons. All the main news outlets are currently carrying the story of the killing of four Israeli colonist-settlers yesterday by the military wing of the Islamic Resistance Movement, Hamas, near the Palestinian city of Hebron. (5/10) It is not difficult to imagine that the UK govt’s reaction would have been rather different if it had been, say, Iran that had massacred a group of aid volunteers [on the Mavi Marmara]. If we had the kind of hate speech and libel laws here as they do in the UK (thank goodness we don’t), I’d file a complaint against Bungalawa on behalf of Israel and the IDF. Almost everything he says is anti-Israel, but I’ve excerpted only those quotations which appear libelous. He is also remarkably rude to Melanie Phillips — perhaps she should sue him too? Eggsclusive! Harriet Sherwood to go ‘free range’. The reporting on this horrible event has been quite, quite appalling. Victim-blaming is nothing new but for a family slaughtered in their beds it takes some guts. It reminds me of the school bully who, when asked why he continued to hit the kid with glasses, responded :”Because he hits me back…”. Thanks for sharing the link to Melanie Philips’ article. She calls it how it is. On the subject of your article, well bungling Bungalawa is a racist in addition to being a snivelling populist. Is this surprising? The Guardian cums in their pants every time an Israeli is killed. It is a fetish. And this so-called Muslim rights groups, they couldn’t care less about Muslims. Israel is the only country with 1,000 miles where Muslims have full rights. That’s why Israeli Muslims aren’t emigrating to Europe en-mass like regular Muslims. IF UK muslim lobby groups want to sway government opinion on their side, about they stop peddling the lies against Israel and pimping Hamas and focus on countries that truly victimize Muslims. The arch-Bungler’s true colours come shining through once again. In a hilarious show of pot-and-kettlery he has let his animus towards Mel Phillips (who could knock spots off him with both hands tied behind her back) bypass what passes for his intelligence. He is rude to Mel Phillips because she is female and more intelligent than he is. He is exhibiting castration fears. This rabid antisemite who taught antisemitism to Ed Hussain (he says that he has grown out of his “Tribe of Judah” * days but as we see we need only scratch his surface and out comes the Jew-hatred, although it’s “disguised” as hatred of Israel) isn’t even worthy to mention Mel Phillips’ name. And note how this supporter of stoning, sharia and a global caliphate, which would be anti western democracy is so quick, in the fashion of his egregious co-religionists, to use our laws against us. As the article at Harry’s says, Bungler is not very bright. If he were he’d realise how foolish he looks. But I hope he keeps on being a fool in public. Celebrating the murder of children is something that could happen only in a sick society. When the Gazans handed out sweets on the streets to celebrate the death of the Fogels and their poor children, they eloquently illustrated the depth of depravity to which Arab society has sunk. Sorry? The VICTIMS are the misguided ones here? Even in the face of an act of barbarism, Inayat still can’t quite stop himself adding a qualifier. I would urge all readers to support Melanie at the Spectator itself and to write to Bedfordshire Police and ask whether they really have the people power to pursue this fairly and whether the arch-Bungler’s is a valid complaint in law. If not then we should insist that he be charged with wasting police time. The end result of all this is, of course, that the distinction between truth and lies and reality and make believe become more and more blurred and may eventually be lost. One has only to look at the overblown statements of many Arab leaders which bear this out. Taqiyya also builds an edifice of mistrust from childhood (if people are allowed to lie simply because they think they are under threat rather than because they actually are, where does it end?) and provides the building blocks for the paranoia so dominant in the Arab/Muslim world, because people think they are being lied to and deceived and, more importantly, have failed to develop the intellectual and cognitive means to test out their perceptions. Contrast this with the injunction by the Rambam against smooth and deceptive language (see my article at http://cifwatch.com/2010/06/06/smooth-and-deceptive-language/). The archBungler cannot be allowed to get away with this affront to decency. The Jews ‘stole’ no man’s land but the land of their own, the land of Israel. The Arabs invaded the land throughout the last couple centuries as workers and servants of the Islamic occupiers of the land: The Ottomans Turks and the Egyptians (for a very short time in the middle of the 19th century). Jews always lived on their national soil under foreign occupiers through the last 2000 years of history and they even were the majority in Jerusalem since 1840! There were no any Palestinian people but the Jews. The Arabs despised that name because it symbolized ancient Judea and Roman’s conquer of that land. There isn’t even “P” in Arabic, so it is very odious to claim that Arabs are “the indigenous people of the land.” You better say that Arabs, none-Muslim Arabs, and none-Arab Muslims emigrated from their national lands and infiltrated into the land of Palestine to seek for refuge and work. The numbers of Palestinians Arabs were systematically low throughout the last 5 centuries and increased dramatically in the beginning of the 20th century, as reaction to the Jewish highly growth in population, until than being rather a small community. The now days “Palestinian people” is a new historical invention started Just after Israel‘s independence, in order to create a new leverage of the Arab states to fight against the existence of the Jewish state in their Dahr el-Islam. Just look at UN 242 resolution of 1967, No any Palestinian people is mentioned, just because then the Arabs of Palestine didn’t see themselves as a unique people, but as citizens of their former Arab states. The same method was and is still executing against the other none-Muslims in the region, and that why the number of the Christian Arabs was and is decreasing very rapidly and very extensively. Let not remind the all Pro-Palestinians that Palestinian Arabs have already their own Palestine state, called Jordan. The fact that a foreign king rule them doesn’t refute the fact the Jordan is the Eastern bank of Palestine, handed to the Palestinian Arabs by the British occupier in 1922. The fact that that occupier failed to accomplish mission and to hand the Western bank of Palestine to the Jews, as promised, doesn’t deprive the right of the Jews for their historical and national land.